Two different theories exist concerning the origin of children: the Theory of Sexual Reproduction (ThoSR) and the Theory of the Stork (ThoS)…. Nowadays, many people believe in the theory of reproduction, simply because they have been taught this theory in school … A number of the world’s leading scientists are still in favour of ThoS. 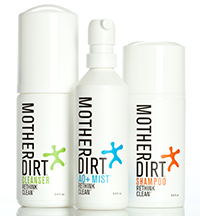 Some recent scientific work (1997–2001) has shown new evidence for ThoS. I confess that I have long been skeptical of the Theory of the Stork, based on the ability of the Inuit to survive with a very small local stork population. It seems clear to me that storks are not absolutely necessary for delivery of children, at least in a Paleolithic culture eating a marine-rich diet. Yet, I admit to being over-skeptical at times. Due to this personality quirk I have entirely missed out on the widely reported benefits of orange juice , aspirin , eggshells , 8-to-12-egg breakfasts , ice baths , and intentional overeating . As a scientist, I feel obliged to follow the evidence wherever it leads. So let’s look at this new evidence for the Theory of the Stork. It’s long been known that human birth rates are correlated with the local stork population. This is true longitudinally (over time) as well as latitudinally (distance from the equator). The latitudinal evidence is too obvious to show, it is why Arctic and Antarctic populations of both storks and humans are so small, but the longitudinal evidence may surprise many. The strength and weakness of the data are apparent. The correlation is clear, yet the correlation does not quite reach statistical significance. It seems the number of children per stork fluctuates from year to year. On the left is the correlation of total deliveries with stork population. The correlation is quite poor; perhaps Berlin hospitals are particularly forbidding to storks. 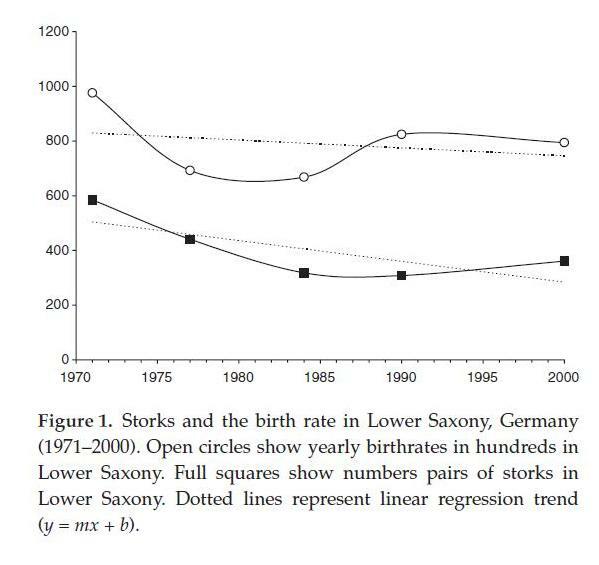 On the right is the correlation of out-of-hospital deliveries with stork population. The correlation is much, much stronger. The implication is clear: if you want your baby to be delivered in the traditional way, by stork, do not enter a hospital. It looks like obstetrical science is heading toward a hybrid theory, in which both medical deliveries in hospitals and stork deliveries contribute to the human birthrate. To conclusively resolve remaining conflicts between the Theory of Sexual Reproduction and the Theory of the Stork, randomized clinical trials will be required. But funding agencies will never step forward with the millions of dollars required for such a trial as long as Big Hospital controls obstetrical research. For the foreseeable future we will be limited to epidemiological evidence. I personally find the new epidemiological evidence in favor of the Theory of the Stork quite as compelling as the epidemiological evidence against red meat and white rice. However, until clinical trials have been performed, I think it is prudent for pregnant women to continue to utilize medical delivery services, and to rely upon storks only in emergencies. Höfer T et al. New evidence for the theory of the stork. Paediatr Perinat Epidemiol. 2004 Jan;18(1):88-92. http://pmid.us/14738551. ← Red Meat and White Rice, Oh My! I’m amazed that someone got that paper published because of the heavy publication bias against Stork Theorists. 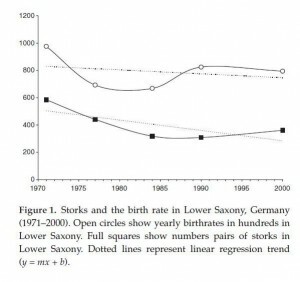 Do we have any data on the correlation between births and stork species? 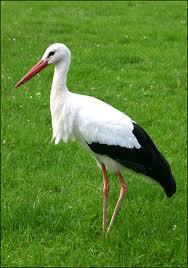 Are we talking about African or European storks? I was always led to believe that storks leave the babies under a bush. So clearly the inuit have to travel some distance to pick up thier babies. This may be why there is poor correlation between storks and babies in that part of the world. Darn. I was betting you’d prove the earth is flat … and if you did, I’d go with it. Wow. I stood staring at my phone, utterly confused, for a good minute before it hit me. April fools! Well done. Maybe the editor had had a baby by stork. I don’t but it might make a good thesis topic for you. One of the mail-order PhD shops might oversee it for you. Might want to check him for stork DNA! It is testimony to the benefits of omega-3 fats that they have survived at all. You haven’t confirmed or denied it TMK (to my knowledge). *falls over* I’m still shuddering with laughter! I think this deserves further research into the correlation between cabbage patches and children. If storks AND cabbage patches are in high numbers, this might cause an overpopulation. Which would explain why cabbages and storks are rarely both high in numbers in the same location. The world makes sense!!! Science explains everything. All the truths and most of the falsehoods too! LOL – fabulous post – hilarious AND educational! The Inuit use the other pathway – geese. They send them south to get the babies. Everyone else only use them in times of stork scarcity. I used to have Stork margarine on my bread. That explains everything! You know that the medical profession is bitterly opposed to the Stork theory because it would put them out of the birthing business. You are very courageous in exposing them. I see a problem with your experiment. 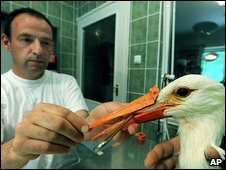 How do we know that chickens fitted with stork beaks won’t adopt stork behavior and begin to deliver babies? You are assuming that stork/chicken behavior is purely genetic, but surely this is naive? First you’d need to do some twin studies where one chicken twin was fitted with a stork beak and raised separately or at least find countries where this happens (although I’m not a big fan of epidemiological studies) and correlate the data. Also stork twins ought to be separated with one stork fitted with a chicken beak. And you’ll have to take into account the epigenetics associated with the beak modifications. Finally, to make it truly ‘blind’, the chickens and storks and farm owners can’t know whether they are (or own) chickens or storks. A less rigorous approach would be to have them fill out questionaires on how stork-like or chicken-like they are feeling (although I’m not a big fan of self-reported data). We are probably looking at hundreds of millions of dollars for research, actually, but I think it’s imperative to settle ToSR/ThoS with sound science. I do think it is imperative, as long as we can get a cut of the research funds. Thanks for your design improvements! This new evidence has me concerned that the rise in popularity of hunter-gatherer style diets will reduce the stork population and threatened all mankind. LOL, that was good. I was REALLY REALLY wondering where this whole post was going. Then I read the date posted =D. Keep up the good work haha! Stephan tweeted it – seems to show that PUFA was better for the liver than SFA in obese subjects. I did see that. The changes in liver fat were very small, but more importantly, in much PUFA research the short-term effects are very misleading compared to the long-term effects. The body tries to dispose of PUFA more quickly than it tries to dispose of SaFA. This makes sense — PUFA is more dangerous. But it makes it look like PUFA is promoting weight loss or fat loss. That appearance is deceiving. Thanks Paul. Makes me wonder why Stephan tweeted it then …same question pending at his blog. This is total rubbish! What about all the babies that are found in potato patches? Huh? Forgot about those didn’t ya? I will never believe in the stork. Babies come from potatoes. Sorry, tater, I only cite to peer-reviewed literature. Potatoes are so discriminated against, there isn’t a single study on Pubmed to tell us how many babies are born in potato patches. Probably the ob/gyn journals are run by low-carbers. Let’s get serious here for a minute, shall we? 🙂 I’m still trying to get the weight-loss plan to be second nature to me. One more question: what about the extra egg yokes? Should I be adding them or save for the “maintenance phase”? Thanks! You should include the yolks. 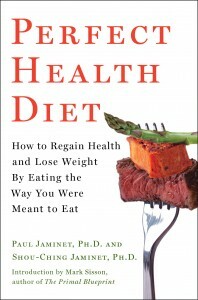 You don’t want to totally eliminate dietary fats, you just want to make sure they are nutrient-dense, as egg yolks are. yolks. not yokes. My bad.